12 ounces shredded cheese (Cheddar, Mexican blend, Colby, Jack or mixture of any) I have found that I like to use 8 ounces of Colby or Jack to 4 ounces of Cheddar, it makes it creamier. Heat oven to 350 degrees and thinly coat a large casserole dish with oil-I like to use olive oil but vegetable will work just as well. Bring a large pot of salted water to a boil and cook pasta 2 minutes less than directed. Drain well and place in the casserole dish. Heat 1 Tbsp olive oil in large skillet over medium heat and brown the ground beef, until cooked through, about 10 to 12 minutes and drain well. Add the browned ground beef to the pasta. Heat the remaining tablespoon of olive oil in the same skillet adding the onion and garlic. Cook until the onion becomes soft, about 3 minutes. Add cumin, coriander and salt. Cook until spices become fragrant, about 2 minutes. Add flour and cook for 3 minutes, stirring constantly. (Add a touch more olive oil it seems to dry.) Gradually add milk and stir until smooth. Increase heat to medium-high and simmer until thickened. Turn heat down to low heat and add cream cheese and 8 ounces of shredded cheese, stirring until melted. Stir in Ro-Tel tomatoes. Add the cheese mixture to the pasta and ground beef and stir well until fully incorporated. Top with remaining shredded cheese and bake for 20 to 30 minutes until golden brown and bubbly. Let stand for 5 minutes (if you can) and then ENJOY! Ok, so this particular favorite food of mine will get at least 3 chapters, this being Chapter 1. 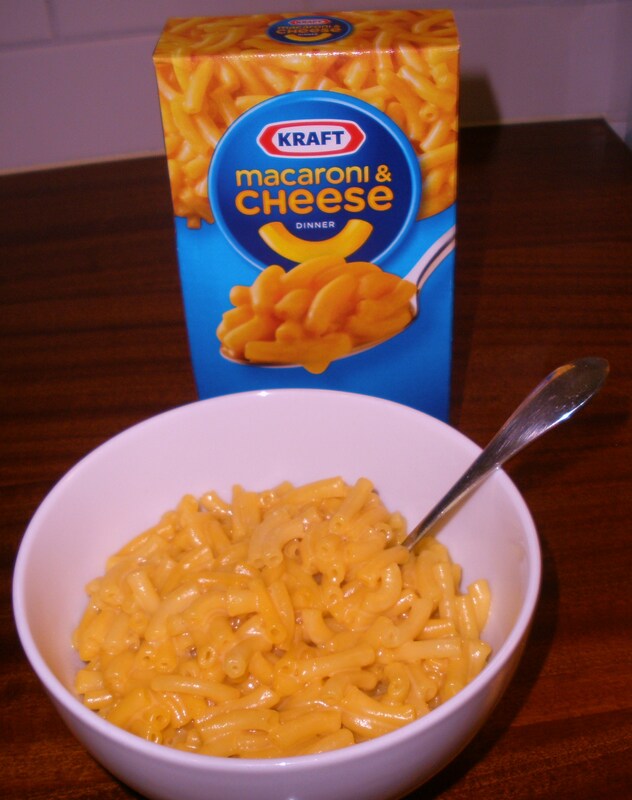 I believe that it was love at first bite when I had my first taste of Kraft macaroni & cheese, although I’m not sure exactly when that was. It got me through college and whenever I don’t feel well it’s the only thing I really want to eat. I do remember going to a friend’s house when I was about 13 for dinner and they were having macaroni and cheese; just macaroni and cheese. I had never heard of such a thing. Her mom had made I’m not sure how many boxes and then put it in a large pan and baked it but that wasn’t even the best part. She served it with sour cream! As if just having mac & cheese for dinner wasn’t enough of a treat, I got to smother it in sour cream. It was absolutely incredible! I know that are foodies out there who say that I cannot be a “real” foodie if I like anything that comes out of box in powder form and is technicolor orange, but I am and I do! And keep in mind that you do add real milk and real butter, so good! Now I have always known that you can add all sorts of things to this mac and cheese to make it a meal or a more hearty side dish but I prefer it “au natural” , just plain and lovely. My husband has just discovered at a friends suggestion that his favorite way to eat it, is with red-hot pepper flakes sprinkled on it, why didn’t he think of that?! But did you know that there are gazillions of recipes out there to enhance and entice you into eating more mac & cheese. On the Kraft website they have, of course, a macaroni and cheese page with suggestions like: add cut up hotdogs, can of peas or corn, a can of tuna…(not so much) and they also offer suggestions like to spray the top of the foil you put over it when cooking it in the over so the cheese doesn’t stick . They also have an entire section of recipes devoted to macaroni and cheese and a Facebook page. Love the Facebook page where you can post pictures of you, your family, friends, pets and neighbors eating Kraft macaroni & cheese.